Bike Paths (Class 1) are paved rights-of-way completely separated from streets. Bike paths are often located along waterfronts, creeks, railroad rights-of-way or freeways with a limited number of cross streets and driveways. These paths are typically shared with pedestrians and often called mixed-use paths. 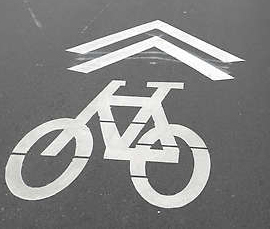 Bike Lanes (Class 2) are on-street facilities designated for bicyclists using stripes and stencils. Bike lanes may include buffer striping to provide greater separation between bicyclists and parked or moving vehicles. Bike lanes are the preferred treatment for all arterial and collector streets on the bikeway network, and not typically installed on low-volume, low-speed residential streets. Bike Routes (Class 3) are streets designated for bicycle travel and shared with motor vehicles. While the only required treatment is signage, streets are designated as bike routes because they are suitable for sharing with motor vehicles and provide better connectivity than other streets. Arterial Bike Routes (Class 3A) are installed on arterial streets where bike lanes are not feasible, and parallel streets do not provide adequate connectivity. These streets may be designed to promote shared use with lower posted speed limits (preferably 25 mph), shared lane bicycle markings (“sharrows”), and signage. Bike Boulevards (Class 3B) are bike routes on residential streets that prioritize through trips for bicyclists. Traffic calming is included as needed to discourage drivers from using the boulevard as a through route. Oakland's Bike Boulevards are marked with shared lane bicycle markings (aka “sharrows”) and signage. Protected Bike Lanes (Class 4), also known as cycle tracks, provide space that is exclusively for bicyclists and separated from motor vehicle travel lanes, parking lanes, and sidewalks. Parked cars, curbs, bollards, or planter boxes provide physical separation between bicyclists and moving cars. Where on-street parking is allowed, it is placed between the bikeway and the travel lanes (rather than between the bikeway and the sidewalk, as is typical for Class 2 bike lanes). Phase 1 of the Telegraph Ave Complete Streets Implementation Plan constructed the first parking-protected bike lane in Oakland in May 2016. Sharrows are pavement markings that indicate shared-use lanes. The markings are intended to encourage bicyclists to ride clear of the “door zone” and to alert motorists to expect bicyclists to occupy the full lane. For more information about sharrows, For more information about sharrows, please read the Sharrow FAQ flyer.